This luxury SUV looks downright regal at LEGOLAND. Going on vacation with a family of five is no easy chore, especially when three small kids are part of that family. It takes patience, energy, and a really good vehicle to help mitigate some of the insanity. 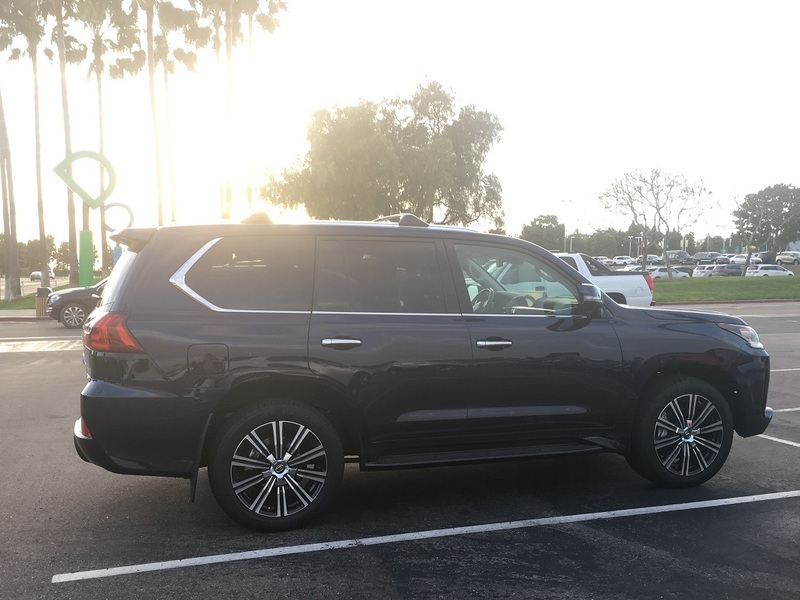 On a recent trip to San Diego from Chicago, Lexus let us test out their 2019 LX 570 for family vacation duty. We made our way around the area for a week and appreciated this luxe workhorse of an SUV. The wife, three kids, and a boatload of gear easily made it to the seaside at Point Loma. No one will argue the Lexus LX 570 luxury SUV needs an overhaul, but that doesn't mean the current model isn't great. In fact, the biggest Lexus in the model line really needs no introduction since it was quite literally one of the first seven-passenger luxury SUVs on the market when it bowed as a rebadged Toyota Land Cruiser back in 1995. Since then, the LX has become a staple in the Lexus lineup. From tip to toe, the LX 570 is dramatic. The spindle grille is downright huge and totally intimidating for slow-drivers in the left lane. As we headed from the San Diego airport to our Airbnb rental half an hour away, smaller vehicles peeled off to the right one by one as we hammered the big V8 engine. The kids were oblivious thanks to the comfortable captain's chairs and the dual-screen rear entertainment system. The big LX looks proper parked on the affluent streets of San Clemente. The LX 570 in three-row trim is perfect for a family of five, and we even brought our nanny with us, and there was ample space for all. The third row is a split folding rear seat, but they're "jump" style seats, meaning they fold to the side with the push of a button, making it convenient to stow luggage, a stroller, or whatever large kid gear requires easy stowage. Even after more than a decade on the market, many of the premium features in the LX stay current in terms of convenience and ease of use. There aren't many small item storage options in the cabin, especially at the base of the center stack and in the center console (other than the keep, beverage cooling center armrest), one criticism of a family-oriented vehicle. Also, the infotainment system does need updating to at least be current with versions in the new UX 200. These both should be addressed in the next-generation LX. At no point, however, did we feel we were lacking anything of significance over the seven days of our trip. We used the LX 570 every day and felt spoiled by its cabin. The big center stack is easy to access, and the materials quality is top notch. Virtually every aspect of luxury is addressed, including fine leather seats with heating and ventilation, adaptive cruise control, a refined sound system, and a plush ride are all part of the LX 570's arsenal. We really love the naturally-aspirated V8 engine with its 383 horsepower and 403 lb-ft of torque that's at the ready and doesn't exhibit the lag of turbocharged mills that are ubiquitous. At one point, we were trying to get around slow-moving hybrid and gave the LX a healthy dose of throttle, and it moved way faster than we expected and actually chirped the tires. That's our kind of vacation. Brake feel could be much better. The pedal is too mushy, and though the brakes stop the LX decently, it's difficult to be precise with them. Also, for a vehicle this large, it's not mindblowing in terms of passenger space. The Lincoln Navigator/Ford Expedition are more modern and more spacious, and even the Dodge Durango feels more open inside. But few vehicles feel as solidly built as the steel ladder structure of the body-on-frame LX. Despite the fact that the LX 570 does need a redesign, the current luxury SUV is still more than capable of handling a big family with lots of gear. It's an excellent cruiser that's well-appointed and full of standard features you'd expect for close to six figures. We felt spoiled on our trip, not so much by our accommodations but because of the LX 570's premium look and feel. It's still a contender in the large luxury SUV segment.